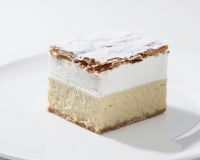 The original Bled cream cake is a recognisable feature of Bled that you simply must try when you come here. Despite being 60 years old, this sweet lady remains eternally fresh and youthful in its flavour. Where can you try the original Bled cream cake? There is only one original Bled cream cake! Features: The layers from the bottom to the top follow one another as follows: puff pastry, custard, whipped cream, puff pastry and icing sugar. How do you distinguish the original from the rest? When you place it on the plate, the entire cream cake must sway back and forth. 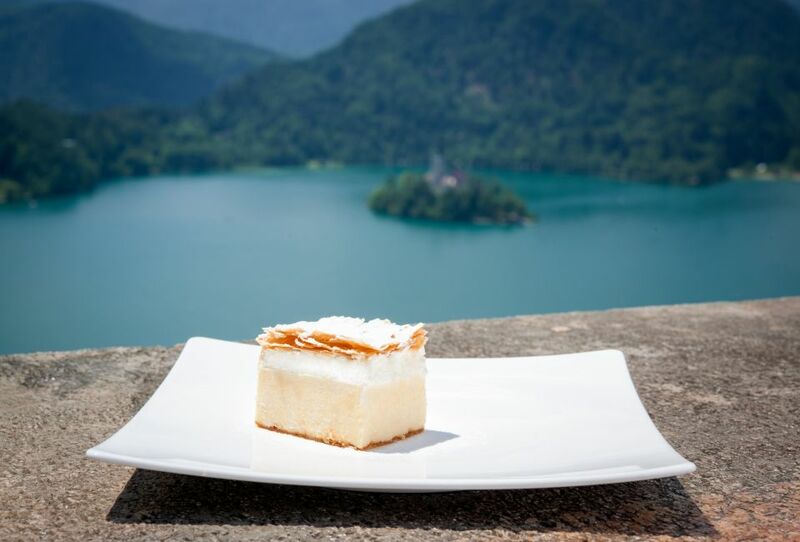 A visit to Bled just wouldn’t be right if you didn’t treat yourself to the original Bled cream cake. We make them in the Hotel Park pastry kitchen, but you can try it in all the Sava Hoteli Bled bars, cafes, restaurants and hotels. We stick closely to the original 1953 recipe. We use natural ingredients: eggs, flour, cream, sugar and butter. The original Bled cream cake contains no colourants, preservatives or other additives, which is why we make them fresh every day. Cream cakes are made several times a day, while on weekends (the busiest time for Bled in terms of visitor numbers), we prepare them every hour so that they are truly fresh at all times. Most original Bled cream cakes are sold at their home, the Park Café on the Bled promenade! Only the original is the right one! You can buy cream cakes nearly everywhere. But it is only at the bars, cafes and restaurants of Sava Hoteli Bled that you can try the original Bled cream cake made to the original recipe, which we have kept a secret to this day! The original Bled cream cakes are made in the Hotel Park pastry kitchen every day and with the same preparation procedure. You will find fresh and fragrant cream cakes here every day! The father of the cream cake was the master confectioner Ištvan Lukačević, who moved to Bled from Vojvodina. Using the cream cake of his homeland as the basis, he created the version that became the hallmark of Bled. We have developed numerous versions of the cream cake over the years – from the chocolate one to the fruit one, and last but not least, the cream cake-flavoured ice cream! Cream cakes are packaged neatly in take-away packaging! The home of the original Bled cream cake is the Park Café on the Bled promenade. This is where it is enjoyed in the greatest numbers. Probably because you can enjoy the view of Lake Bled from the café terrace! Baking the cream cakes at the cake shop of Hotel Park takes place every day and using the same preparation procedure. Then fold the pastry seven times and bake it to the exact level of crunchiness. Using natural ingredients, they prepare the fine custard, letting it boil for exactly seven minutes while whisking it egg whites whipped to hard peaks are folded in while the custard is still hot. The still hot yellow cream is poured over the crunchy puff pastry sheet. Once the cream has cooled completely, whipped cream is spread over it and then covered with another sheet of puff pastry. The entire cake is then luxuriously sprinkled with icing sugar and the cake is cut into 7 x 7 centimetre-sized pieces. Ever since 1953, the cake shop of Hotel Park has been conscientiously recording the numbers of baked puff pastry sheets used to create these enticing cream cakes. 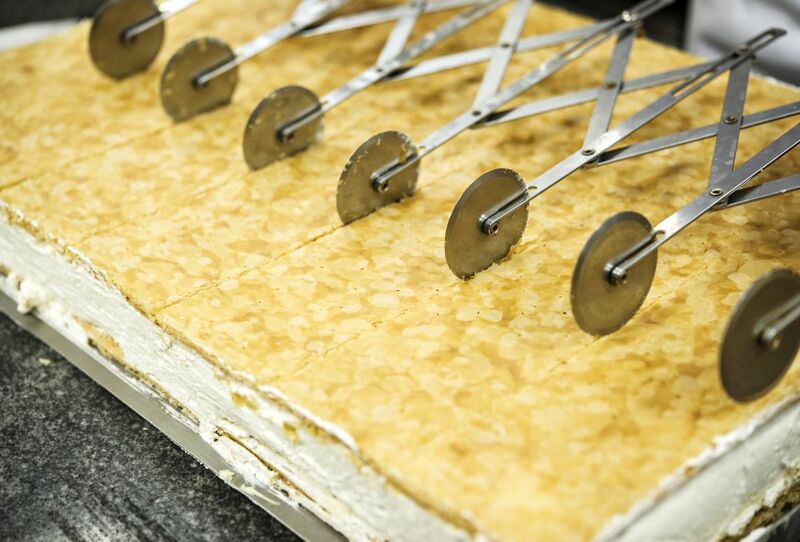 More than 14,000,000 of the original Bled cream cakes have been made in over 60 years. For these, they used about 380,000 litres of cream, more than 863,000 litres of milk, over 6,759,130 eggs, more than 112 tonnes of flour, over 300 tonnes of sugar and more than 78 tonnes of vanilla sugar. On beautiful spring and autumn weekends, they bake from 2500 to 3500 pieces, while bakers still reminisce about the record weekends in the late 1970s when up to 6000 cream cakes were made in a single winter weekend. During that period, Lake Bled froze over regularly and the winter wonderland attracted many visitors who skated on the lake and treated themselves to something sweet.